It was never supposed to be this close. And of course she was supposed to win. How Hillary Clinton lost the 2016 election to Donald Trump is the tragic story of a sure thing gone off the rails. For every Comey revelation or hindsight acknowledgment about the electorate, no explanation of defeat can begin with anything other than the core problem of Hillary's campaign--the candidate herself. 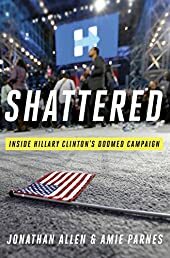 Game of Thorns: The Inside Story of Hillary Clinton's Failed Campaign and Donald Trump's Winning Strat..
Guilty as Sin: Uncovering New Evidence of Corruption and How Hillary Clinton and the Democrats Deraile.. Become a fan of GetBestEbooks.com on Facebook for the inside scoop on latest and most exclusive books. Copyright © 2017 GetBestEbooks.com - All rights reserved.